I promised these symbols to visitors of my Illustrator Freebies website over 2 years ago, but alas, life intervened and they were forgotten. While moving the contents of that website here to Knitting-and.com, I found the files again so now they’re here at last! 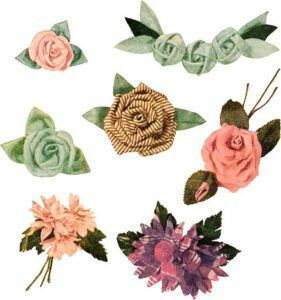 These are the flower symbols I used to create the flower swag border and allover vintage fabric flower pattern. These symbols have an enormous number of uses including scrapbooking, printing onto fabric for crazy quilting, fashion swing tags and many more. Copyright Sarah Bradberry, February 16th 2016. All rights reserved. thanks sarah , are we free to use them for our graphic design ? Yes, I allow them to be used as part of graphic designs, but not for fabrics as I sell those in my Spoonflower shop.